My husband and I don't get to go out on dates often, but in the winter, dates do tend to be indoors and typically dinner or a movie. We end up sitting and chatting (and eating of course) but not really getting a chance to do something together that can really bring us closer. So, I got a babysitter and we went out for a Winter Trails Day Walk. 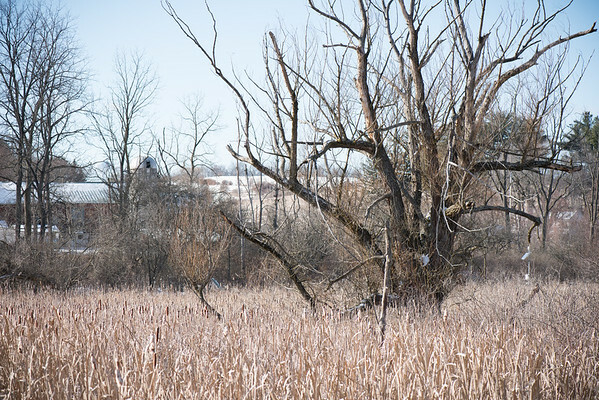 It was a guided tour through one of my favorite spots: Millbrook Marsh in State College, PA. 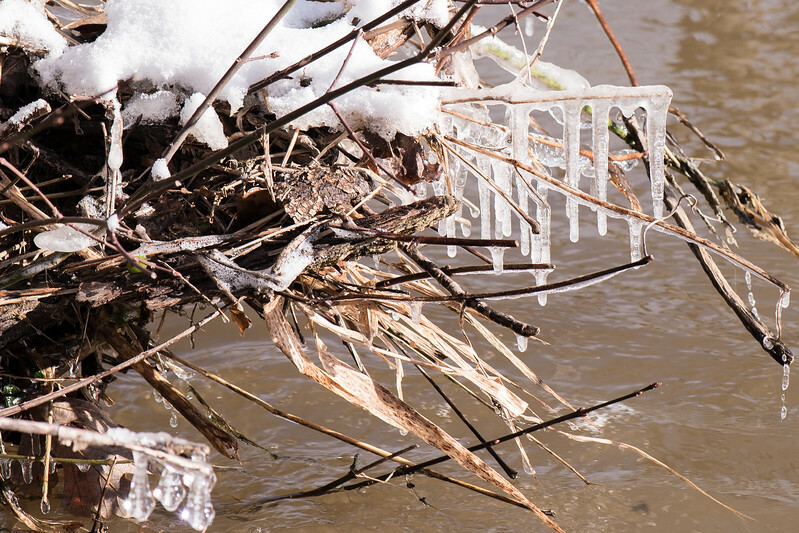 I brought my camera along to snap some photos of my favorite winter weeds and other fun sights. Enjoy! 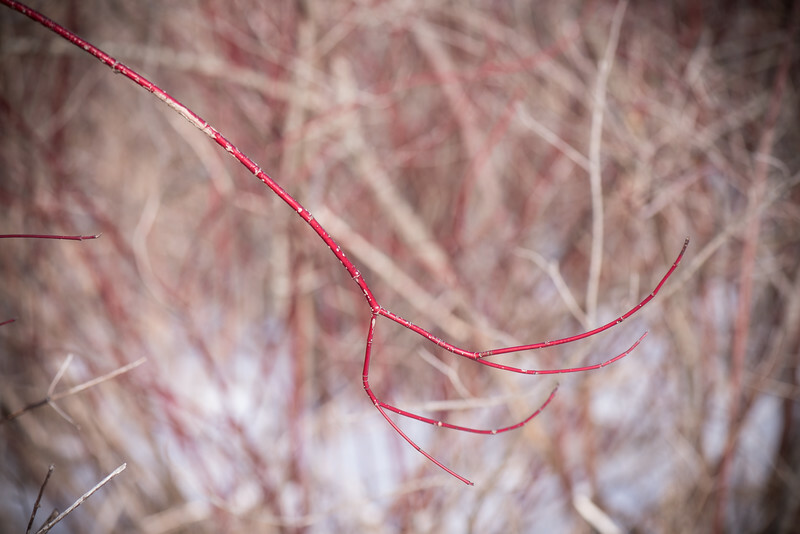 This is a Red-Twig Dogwood. It is a PA native plant and related to Dogwood trees. Their lovely red color stood out stark against all of the brown. I loved the sweeping line of the branch above. 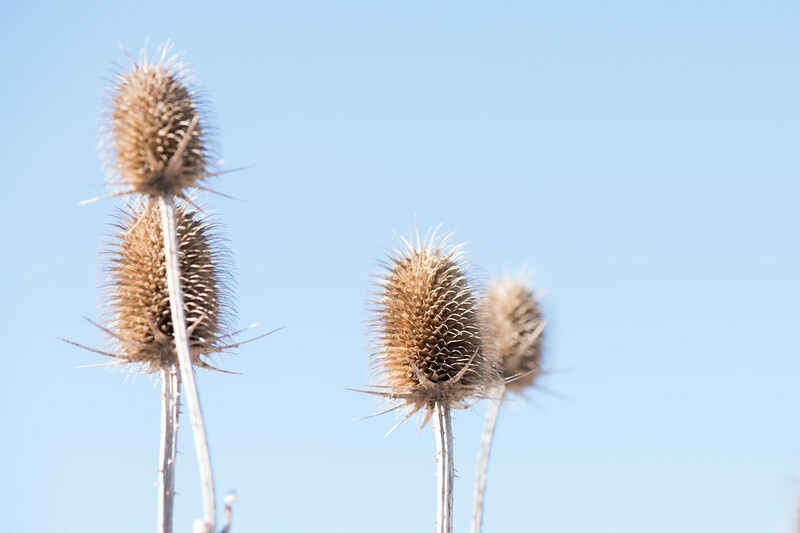 In the image below, I loved how they are all reaching up into the blue sky. 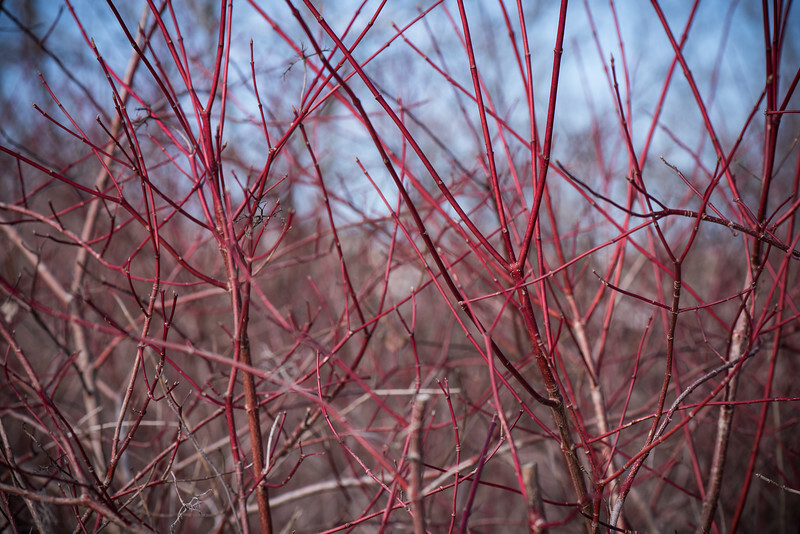 If you're into planting shrubs that are native to PA, you might want to check out this blog Q & A from Penn Live to learn about the benefits of these plants. Brady and I learned that ducks don't always fly south for the winter. Some love the spot that they've claimed for nesting in the spring so much that they don't want to risk losing it to another if they leave for the winter. So, they stay. Oils in their feathers help them stay dry and warmer despite the temperatures we were walking around in on Saturday (18 degrees!). I liked the photos of the ice right next to them! 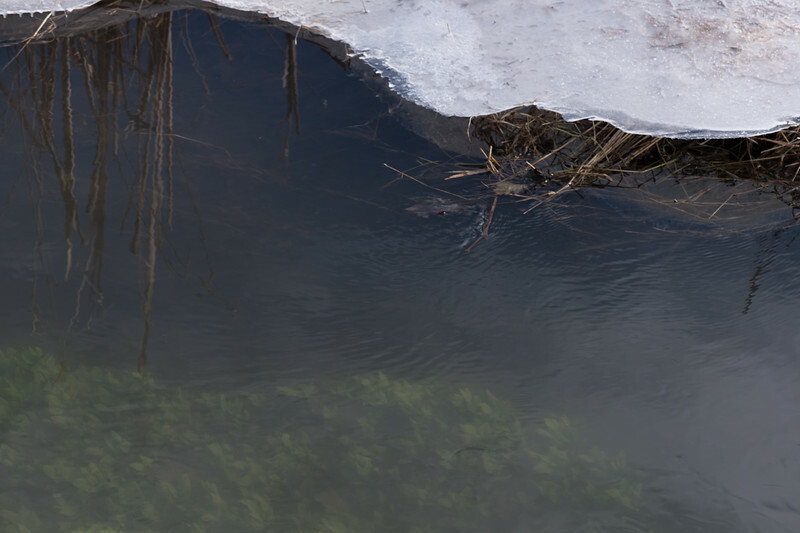 In another image below, you can also see some vegetation still growing under the water, which I enjoyed from a photographic place of color and composition but I found interesting too! We walked along the wooden plank path, our groups series of boots making such loud crunching sounds that it was nearly difficult to hear someone speak, looking out onto the marsh, which is beautiful in every season. 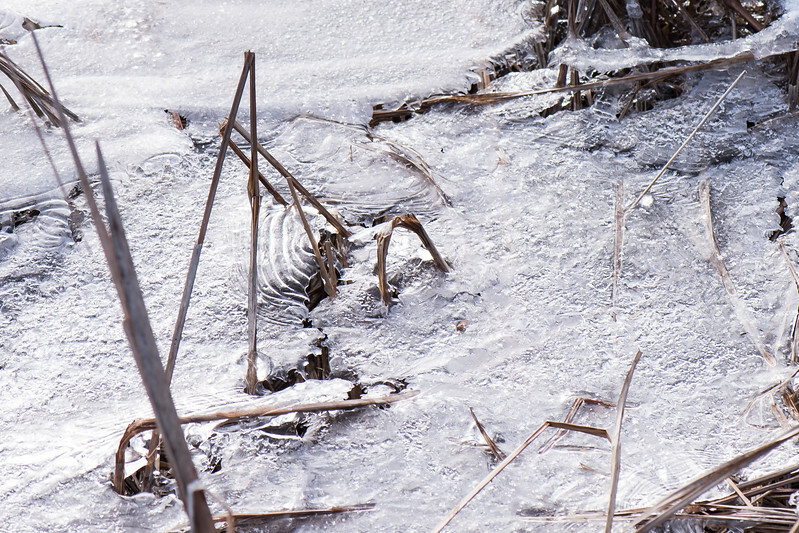 in this season, many of the marsh grasses were matted down with ice. 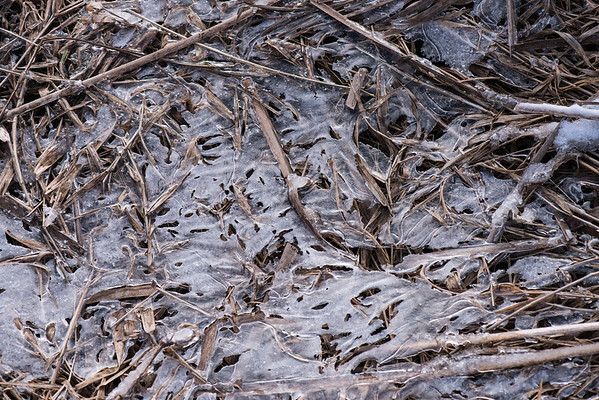 I loved looking at the patterns of ice formation and of breaking ice surrounding the winter brown stalks. The waterways were a bit higher than usual for sure because our region had experienced lots of rain the week before in an especially warm week for the season. 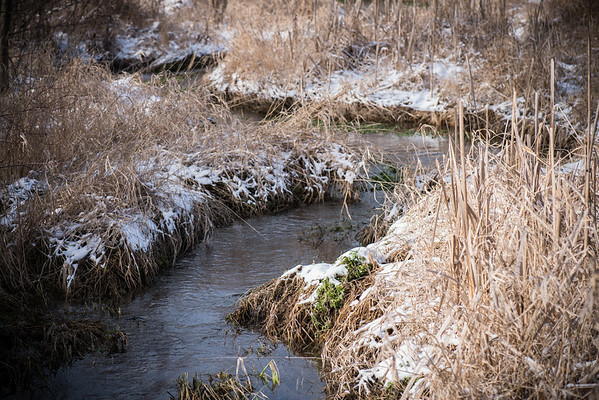 Although the ground was frozen, the marsh was doing exactly what it was supposed to do: contain the water. 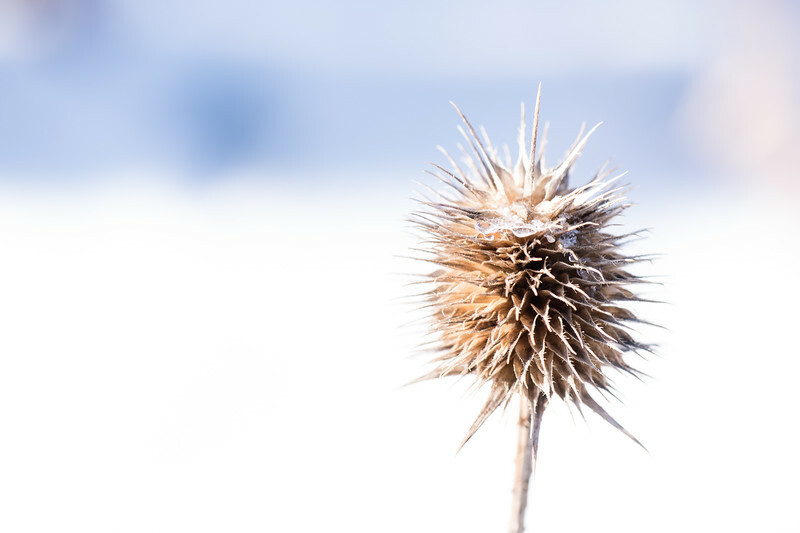 If you know me, you know I have a love of winter weeds. 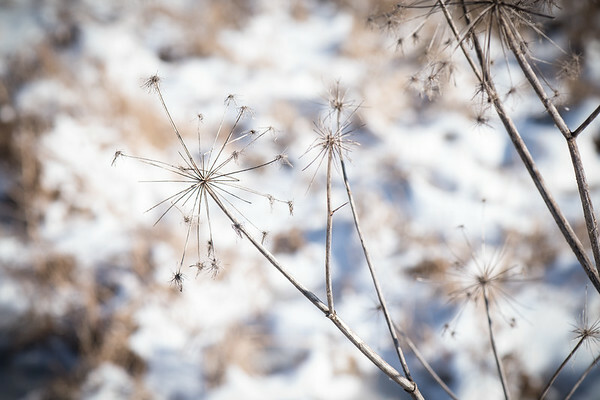 A sprinkling of snow and a field of winter weeds and I just want to observe...and dream of couples willing to do freezing cold engagement shoots in the midst of it! We learned how to spot the differences between mountain lion and dog tracks in the snow and the difference between mink, squirrel, rabbit, and cat tracks as well. 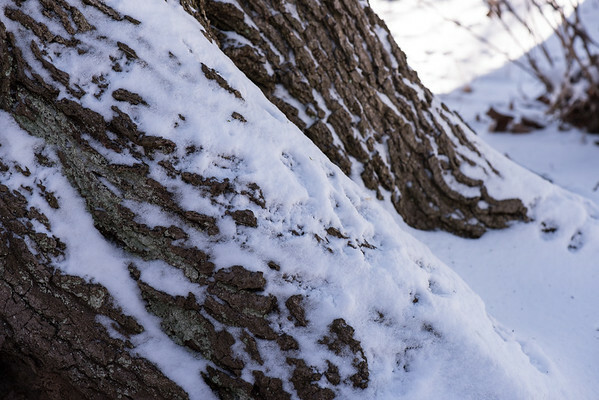 I was taken with the bark patterns and didn't photograph tracks alone. Though, there are a few marred-by-wind squirrel tracks going up the bark of this lovely (and rare) old growth tree in the middle of the marsh/forest. 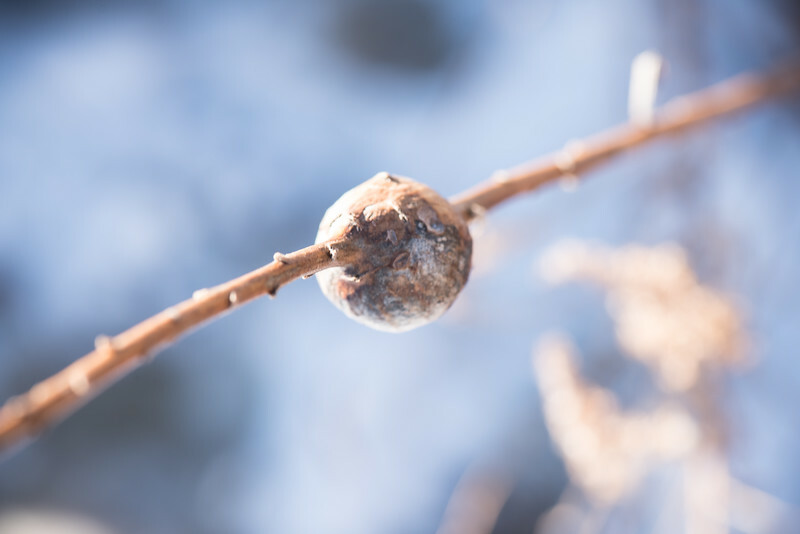 The stick above is a Goldenrod stalk. We learned about the Goldenrod Gall Fly Lifecycle that happens in that swollen ball inside of the reed. The fly lays its eggs in the reed of the Goldenrod. The twig expands to protect itself. However, the swollen area is a sign to a type of wasp that nutrition would be provided if only she would lay her eggs there too, so her offspring can feast on the growing gall flies. The cycle of nature is so interesting! If you'd like to learn more about this, check out the Nature North Web Page. 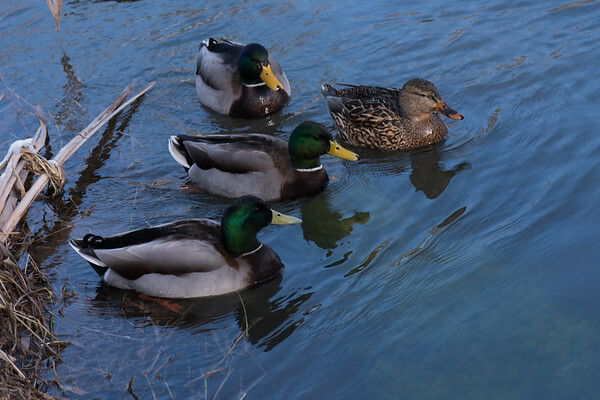 World Wetlands Day Walk Friday, February 2, 2018 10:00 AM - 11:00 AM Ages 12 and older Free, donations appreciated Groups around the world use World Wetlands Day to undertake actions aimed at raising awareness of wetland values and benefits. 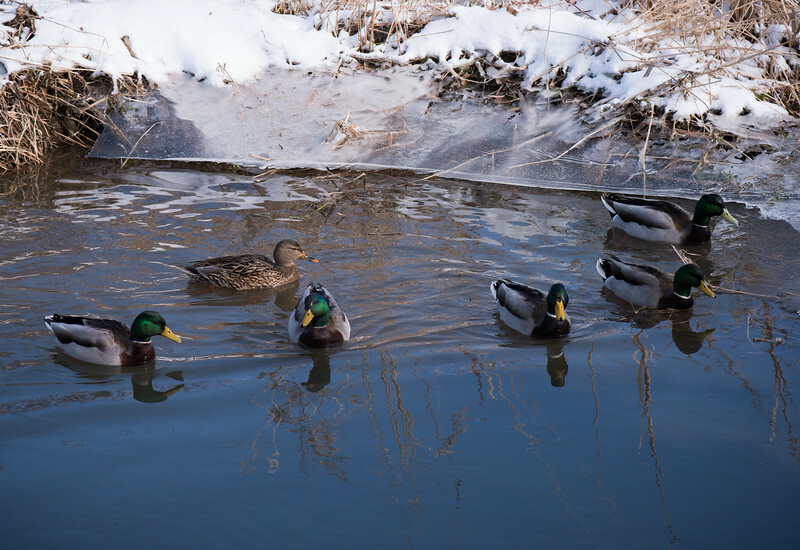 Visit Millbrook Marsh in the winter to celebrate World Wetlands Day. 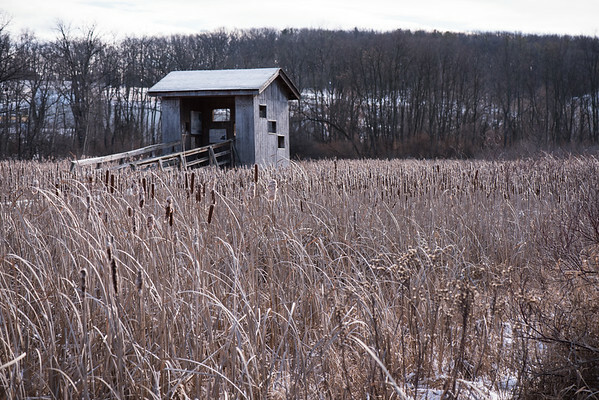 Rob Brooks, a certified Professional Wetland Scientist and Professor of Geography and Ecology at Penn State, will lead the one-hour walk along the boardwalk. 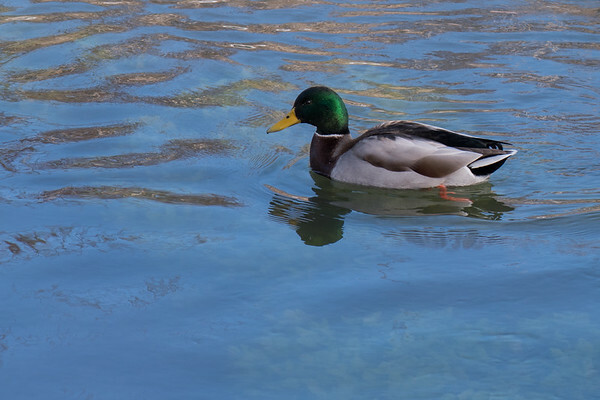 Could Millbrook become a Wetland of International Importance under the Ramsar Treaty? Come and find out! In case of severe weather, we may be indoors. Click here to register. 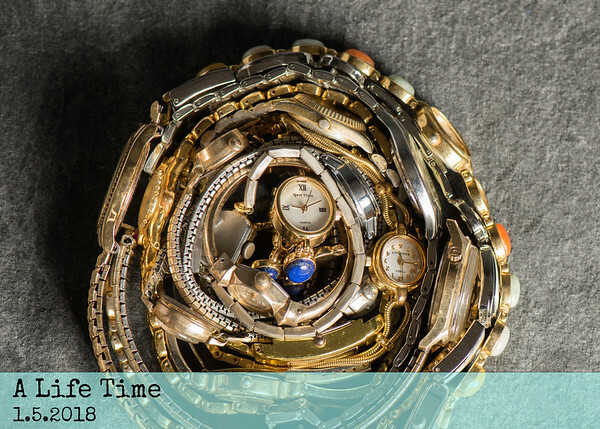 If you'd like to see a sample of my other posts, check out my previous post titled A Life Time. Telling personal stories is an important component of my photographic work!